A shop report based on your sensory review of a store of your choice. This must reference academic research on the senses. A discussion of one artefact including how it is exhibited and curated at a body or fashion-related) exhibition. This must contain academic research about curating practices. A discussion of one costume piece from a film, television programme, music video. This must contain academic research about costume and explain the relevance of your online or archive research. A research report about a fashion archive visit including the items you sought and the processes you followed. A report using your questionnaire methods including your questions, respondent answers and your evaluation. You must show how you take account of the classwork on oral research. A photo essay about fashion disasters in the style of a magazine voxpop. Using two illustrated examples, discuss fast and slow fashion. You must cite academic research. An illustrated piece about a fashion cosplayer and cosplay garment. Illustrate and include research about cosplay. Imagine you are designing a new garment of your choice. It can have whatever features you want, technological or otherwise. Discuss what processes you might use to make it ‘human-centered’ design. How would you go about fostering user participation in your design? A or B. a). 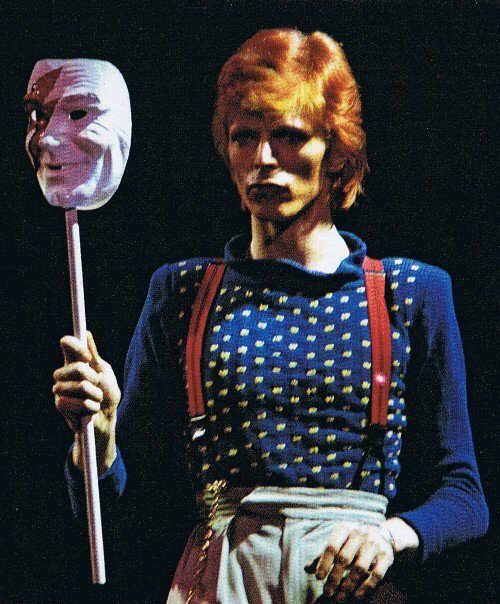 Clearly there is no singular Bowie look. But your job is to choose one outfit, style, hair or make-up choice and research the what, when, why, where and how of it (and also who is behind it, e.g. stylist or designer). Interpret the look by relating it to other cultural, historical or theoretical ideas ……… or ……… b) Look at David Bowie videos on YouTube. Which ones do you remember having seen/heard as original releases? What other media do you remember about David Bowie (e.g. fashion / magazines / film / newspapers)? As you do this, what thoughts/emotions are you having? … write these down. CHOOSE ONE DAVID BOWIE YOUTUBE VIDEO. Reflect on the fashions in the official video. NOW READ THE COMMENTS LEFT What are commentators saying about their memories of David Bowie and about their David Bowie? What other memory events do they talk about (e.g. exhibitions; films). When were these comments left? How many were left in tribute after David Bowie had passed? ONCE YOU ATTEND THE LECTURE ON MUSIC & COSTUME, YOU WILL BE ABLE TO ADD MORE DETAILS AND SECONDARY SOURCES AND USE THIS AS ONE OF YOUR BLOGS. How does fashion communication help in the construction of the body, gender or identity. You must relate ideas to a specific image and use academic sources to explain ideas. Your task is to evaluate a body-related or brand-related case study using a valid research question, a “scouting” of relevant approaches and academic research, and research into your case study, including visual material. Your blog should discuss your group’s 5-minute presentation, and a) identify the what and why of your case study; b) rationalises your choice of research question and approaches; c) show and analyse a range of visual material using and quoting from research. Secondly, an essay of 2000 words. You essay should fulfil the following: you will ask a valid research question about your fashion (or body or identity) topic of interest and pursue research into an answer for that question. You must structure the question in such a way that a) identifies and justifies a valid independent research question; b) introduces, discusses and justifies your research methods; c) introduces and discusses key authors/texts and deploys them in d) a clearly worded argument that communicates the subject area and your ideas, and e) utilises and analyses appropriate artefacts/images in support of your answer.There will be time in class for you to rehearse and present your ideas and you are expected to participate in this. Your writing does not have to be dry and dense to be critically informed. Good academic writing is readable, entertaining and well-researched. SHOULD I HAVE AN OPINION? You should have an informed critical opinion. In other words, research, rather than personal bias or assumed knowledge, should form the basis of the points you make. Opinion that doesn’t look for support or oposing ideas, means you are effectively saying you like or dislike something. Ask yourself what is more persuasive a) just telling the reader your opinion b) showing the reader why you believe your opinion is correct. SHOW, DON’T TELL! Have a point of view, but be prepared to defend it by using effective examples and support from your research. A successful argument is one that anticipates counter arguments. Ignoring counter argument can seem silly and petulant, convincing no one. To analyse something, is to look at it closely and make clear and supported points. Analysis is not description. If you describe costume, this is not the same as analysing it. The latter is all about taking a view of costume based on your research and observations. No one truly has original ideas, at least not all the time. Good writing brigs together lots of ideas from a variety of sources. It’s good to use academic sources, because this is where researchers have spent a great deal of time and effort looking closely at a topic and only publishing it when their peers agree it is valuable work. But mix it up. Other sources, like magazines and blogs, can be full of fresh ideas. Research is a witness to ideas. Just remember, as in a court situation, some witnesses are more reliable than others. Using Google Search is a good way to do some research, but don’t be fooled into thinking all its matches are reliable. Too often, Turnitin reveals that student work has borrowed other student essays, without acknowledgement, and without the author really considering whether the student is a reliable witness or not. When you show your research, you are acknowledging your source. This is a positive thing, a gift you are giving to the reader. Every time you cite research, the academic reader is nourished by your gift. Every time you fail to cite, you impoverish your reader. Introduce your research to the reader by explaining just who the person is, what their key idea is and how and why they came to hold it. When you don’t someone new to your friend, that can seem rude or imply you don’t really know their name (that is, you don’t really know their research). A reference is an acknowledgement that takes a particular form (Harvard at the UAL). It’s relatively quick but precise (Author, YEAR: page number). CAN I DO ALL THIS IN 200 WORDS? Yes. 200 words is a great size for a blog entry. It gives you enough time to make an effective point, one that is fully explained, developed and supported by research. It’s not about quantity, but quality. SO WHAT DOES A BLOG ENTRY COMPRISE? DOES THAT MEAN THAT A LONG ESSAY OF 1000 WORDS CONTAINS 5 POINTS? That’s actually a good way to think about it. The difference is you have time for a longer introduction, where you explain to the reader what you are doing and why you are doing it, and a conclusion. In your blog piece, you only have time to introduce the topic in a sentence before you move on to research and analysis. What a load of b***ocks. Of course you can. You have ideas, you have research. Now just say those things in a blog entry. Don’t waste time worrying about writing, write!